The government has downplayed the climate impacts of oil drilling, but a new study shows that keeping oil in the ground will help fight climate change. The Brutus TLP of Green Canyon Block 158 in the Gulf of Mexico. Vessels continue skimming operations nearby in an attempt to clean up 88,200 gallons of oil that leaked from a flow line at one of Shell's drilling sites about 90 miles off the Louisiana coast in the Gulf of Mexico. 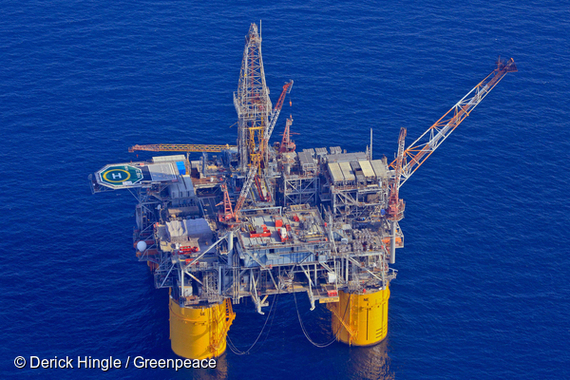 Over his two terms in office, President Obama has enacted strong climate policies, but his proposal to expand offshore oil drilling threatens to undermine these advances. Policies such as the Clean Power Plan and stronger fuel economy standards will help the United States make progress towards the climate goals Obama agreed to in Paris -- but by themselves they won't be enough to limit global warming to 2 degrees Celsius. Obama seems to understand this. He has listened to the demands of climate justice activists by rejecting the Keystone XL pipeline and imposing a moratorium on federal coal leasing. He even said that "we're going to have to keep some fossil fuels in the ground" unless we want large parts of the planet to become uninhabitable. President Obama must act today to cement his legacy as a climate leader by ending offshore oil and gas leasing in the Arctic and the Gulf of Mexico. The Bureau of Ocean Energy Management (BOEM)'s draft Five-Year Program, put forth a couple of months ago, creates a new round of lease sales starting in 2017 and continuing into 2022. The plan proposes to expand oil and gas production in the Arctic Ocean north of Alaska and the Gulf of Mexico, a region that's been called a "sacrifice zone" due to the effects of decades of pollution on local communities and the environment. Just last week, the Gulf was hit again with a spill of nearly 90,000 gallons of oil from a pipeline owned by Shell. A recent study by the Stockholm Environmental Institute (SEI) found that the United States can significantly reduce global greenhouse gas emissions by phasing out fossil fuel extraction on public lands. Specifically, if the president were to remove the Arctic and the Gulf of Mexico from the Five-Year Program and reject all renewals of existing offshore leases, he could reduce global emissions by 26 million metric tons of carbon dioxide in 2030 alone. That's equivalent to taking 5.5 million cars off the road for one year. Because offshore oil production has very long lead times and high upfront costs, decisions made by President Obama today will resonate for decades to come. Phasing out offshore oil leasing will lead to even larger emissions reductions after 2030, but a decision to expand drilling will "lock in" oil and gas infrastructure and make it harder for the world to transition away from fossil fuels. The connection between increased oil drilling and higher greenhouse gas emissions may seem obvious, but BOEM has fought for years to avoid fully measuring emissions that result from its policies. All federal agencies are required to conduct Environmental Impact Statements (EIS) to assess the potential environmental harms of their decisions, and climate change is routinely considered in these reviews. 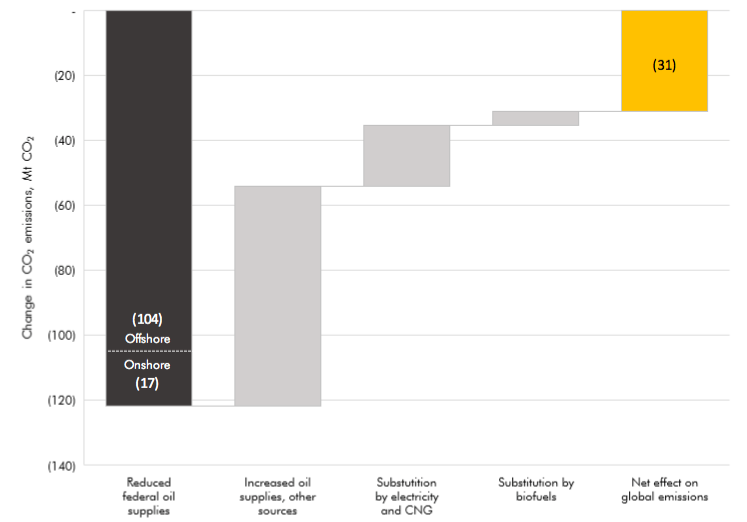 However, BOEM only estimates the emissions arising directly from oil production activities themselves. It has consistently refused to quantify "downstream" emissions that arise from actually burning the oil and gas extracted from the offshore region. BOEM's economic analysis attempts to show that if we do not drill offshore, then that oil and gas would be substituted by oil and gas extracted from somewhere else. Oddly, despite conducting this market analysis, BOEM refuses to take the next step and calculate the emissions from these substitutes. The agency argues both that a full emissions analysis would be "highly uncertain" and that downstream emissions are "assumed to be roughly equivalent" no matter if offshore oil drilling is expanded or halted. Thankfully, the SEI analysis provides answers to the questions that BOEM doesn't want to ask. 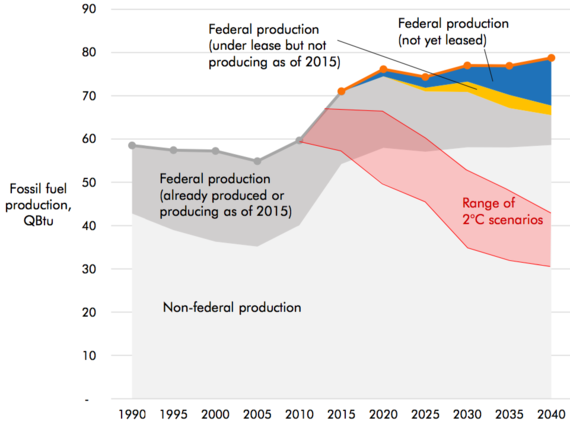 The figure above illustrates what would happen if we left federal oil in the ground. Yes, some of the oil would be replaced by oil imported from other regions, some would be replaced by biofuels, natural gas, or electric vehicles. 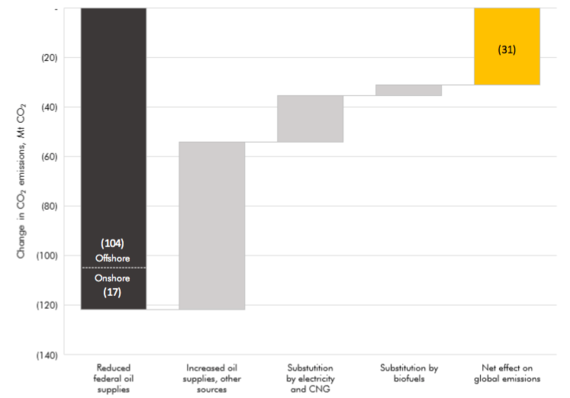 However those substitutions would not make up all of the gap and the difference would translate into reduced overall emissions (that's the yellow bar). What's more, BOEM seems to have left out a major factor from its analysis. In a separate blog post, SEI notes that BOEM's economic report only looks at the domestic costs and benefits of offshore oil. But oil is a globally traded commodity, and ending U.S. offshore drilling will also cause emissions reductions around the world. Factoring in these global effects shows that the full emissions reduction is about ten times larger than the domestic reduction alone. BOEM officials seem to see the writing on the wall. BOEM's chief environmental officer recently told reporters that the agency is "seriously discussing" whether to analyze downstream emissions. BOEM's plan may only last for five years, but the carbon emissions that result from this decision will stay in the atmosphere for up to a century, and we will be paying for the costs of those emissions for years to come. The report from SEI shows that there is still more that Obama can do before he leaves office -- and still much more to be done. For each barrel of federal oil that Obama leaves in the ground, he can lower global greenhouse emissions and make it easier for the U.S. to meet and surpass the climate goals agreed to in Paris. Taken together, a moratorium on federal coal and oil extraction would lead to emissions reductions that are similar in size to policies President Obama has already adopted. 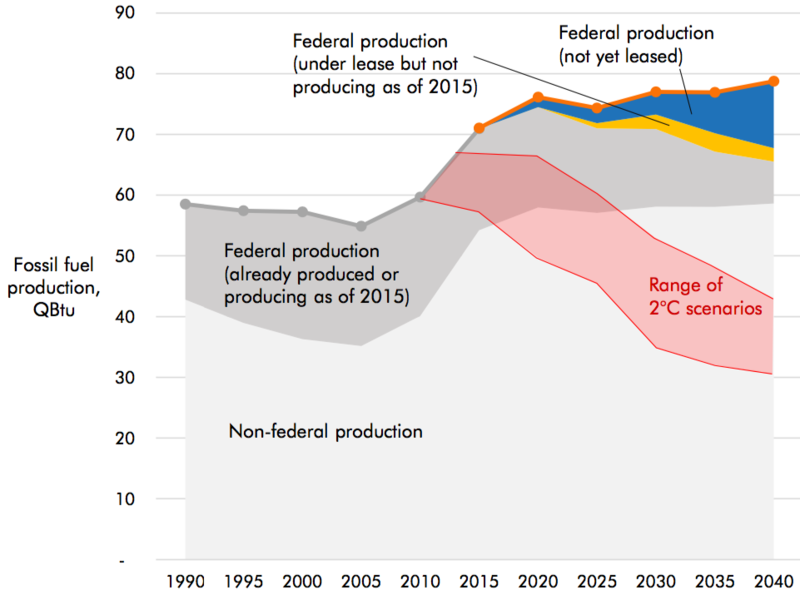 However, even taken together, the Clean Power Plan and a federal leasing moratorium would not be enough to put us on a pathway consistent with 2 degrees Celsius -- much less the more ambitious target of 1.5 degrees Celsius that scientists are now realizing we need to hit. More ambitious policies are needed and the window for putting them in place is short. Before he leaves office, President Obama should end federal offshore leasing and begin a formal review of onshore oil and gas drilling to determine whether those policies are consistent with our climate commitments (hint: they're not). Bold leadership on keeping fossil fuels in the ground would likely make it easier for other countries to adopt similar policies and would add momentum to the climate movement. Similarly, such moves would make Wall Street take notice that investing in risky fossil fuel infrastructure is a bad play. All this means that your activism to keep fossil fuels in the ground is more crucial now than ever. Across the country, people like you have put the pressure on the Obama administration to stop exploiting our public lands and waters for fossil fuels -- and you've gotten results. But with the Arctic and the Gulf still open to drilling, the job isn't done yet. Take action today and tell President Obama to stop new offshore drilling.